The Supervisory Board is, besides the General Assembly, the most important organ of our network. It is elected by the members for 3 years and decides on the main topics in the period between the General Assemblies. Fundamental considerations and the general adjustment of the work programme are prepared here. At the last meeting of its three years term on October 19th 2017 the board waraped up open issues and discussed the budget for 2018. The board met on February 20th 2017 at the EUNET office in Hennef to select the cooperation projects 2017 and to make detailed plans for the Annual Conference and General Assembly in October 2017. A strong focus was set on the future of the Europe for Citizens programme and the final coordination of the upcoming spring meeting. Main focus of the meeting on October 27th 2016 was the work programme for 2017, especially the spring meeting on the occasion of the 60th anniversary of the Treaties of Rome. The board dealt with some technical issues with regard to insurances and bank loans. The implementation report of the Europe for Citizens Programme was discussed as well as upcoming changes in the relations between the EU and NGOs. During its meeting on June 28th 2016 at Canach (Luxembourg) the board already prepared the budget for 2017. Decisions had been made on date and place for the 2017 General Assembly, which will see a new system for registration of participants as consequence of the overwhelming demand to participate in the 2016 General Assembly. The board met on February 25th 2016 at the EUNET office in Hennef to select the cooperation projects 2016 presented by the members. Time was spent on the detailed conference programme for the General Assembly 2016 as well as on the financial details. The board agreed to closely follow the developments in the Europe for Citizens programme as the financial basis for our network. 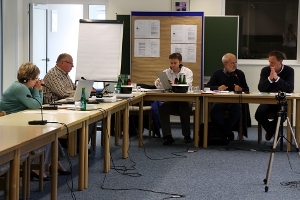 During its meeting on October 22nd 2015 in Wals (Austria) the board dealt with the working programme and budget for 2016 as well as the financial impact of a reduced pre-payment by the EU. 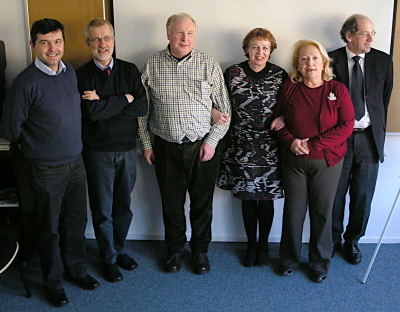 The board met on February 19th 2015 at the EUNET office in Hennef to select the cooperation projects presented by the members. Adjustments had been made to the 2015 budget and lessons learned from the 2014 audit. The changes for the statutes were finalized and are now ready for legal proofreading by an external lawyer. The first draft of the programme for the General Assembly was discussed and further proposals had been made. 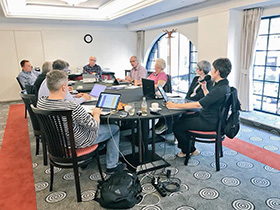 In a two and a half days meeting at Freising the newly elected board tackled the challenges ahead for its three years mandate. The two priority topics were how to reactivate working groups in our network and a change in our statutes with the goal to introduce associated membership. 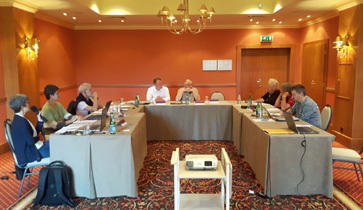 The changes in the statutes will be presented to the members on the General Assembly 2015, taking place end of October at Wals-Siezenheim close to Salzburg (Austria). A network meeting was planned for February next year to gather some of our members at IBZ Gimborn to set up new working groups. The board met at the EUNET office to select on cooperation projects and to catch up with the work programme following a delayed decision of the EU on further funding for the network. became the acting president according to our statutes. Without a decision on our application for EU finding the board also had to deal with preparations for the termination of the association. The board made some major adjustments to the budget with the main goal to allocate more funds to follow-up projects from the open space event in March. Furthermore the content and structure of the General Assembly 2013 was discussed and decided upon. The General Assembly will be split up into a public conference and internal workshops dealing in general with the European elections 2014. The main focus of the meeting on December 10th was to make the new structure more lively and a reality. A decision was taken to amend the annual conference with a working session in March 2013. The board meeting on May 22nd 2012 dealt with the recommendations of the working group “A new structure for EUNET” and the preparations of the General Assembly in 2012. 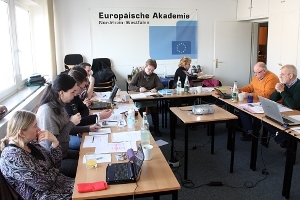 For the first time the board met at the new office of EUNET in Hennef on February 3rd 2012. Main topics had been the challenges for 2013 and beyond. Especially the European Year of Citizens in 2013 and the new EU-programme Europe for Citizens for the years 2014 to 2020 had been in the centre of the discussion. The board also came to the conclusion that the internal structure of the network needs to be revisited. 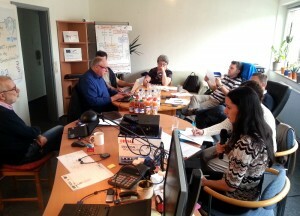 During the meeting in Metz on 13.10.2011, the main tasks for 2012 were discussed and the board went through the various options for the Annual Conference 2012. Members of the Bureau dealt on in particular with the final preparations for the annual conference as well as the budget for 2012 during the meeting on 20.09.2011 at Bonn. 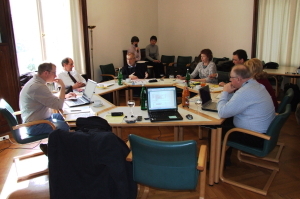 The board met on March 9th 2011 at IBZ Schloß Gimborn. 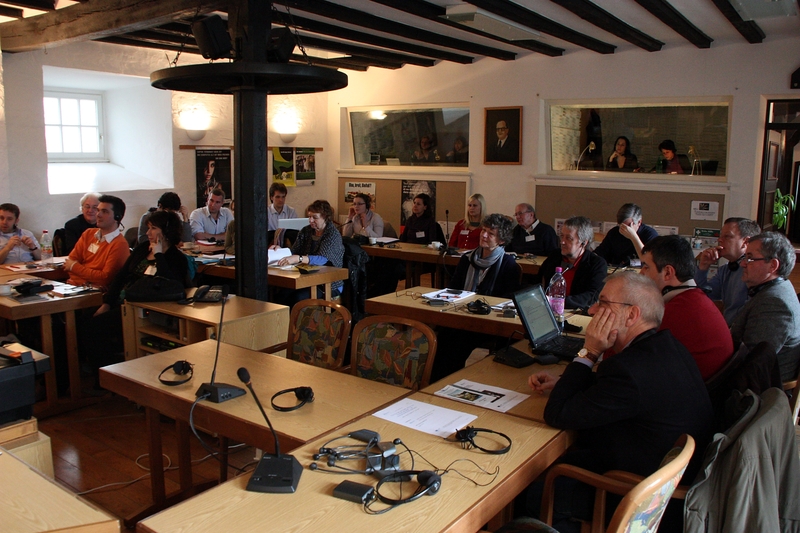 The main focus of the meeting was a discussion on how to improve “networking” within EUNET. The board took the chance to meet with the heads of the committees thanks to the meeting of all committees at the same time. 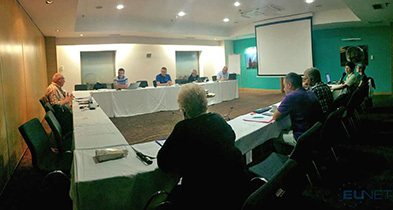 The ideas of the board were shared with all members of the committees during a plenary session the next morning. 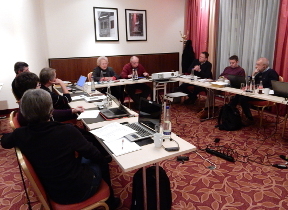 The board met on December 8th 2010 near Bonn. The meeting was focused, besides the usual financial issues, on our activities for 2011. 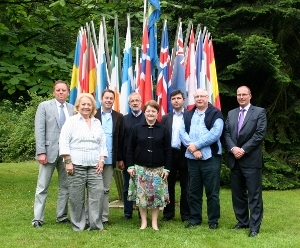 The board meeting on June 15th 2010 at Bonn had been in the focus of the work programme 2011 and the General Assembly 2010. 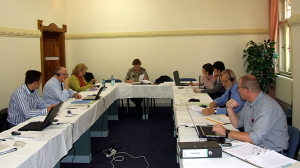 The board has met on March 11th 2010 to, besides others, discuss and prepare the General Assembly 2010. The board met on November 21st and 22nd 2009 at Strasbourg. For the first time a joint meeting together with the chairs of the committees took place. New board elections. The General Assembly elects Catherine Guy-Quint as new president of EUNET. 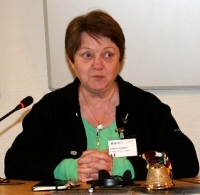 On the General Assembly 2008 Nina Nørgaard stepped down as president. Until new elections for the entire board the position of president is temporarily held by the 1. Vice-president. 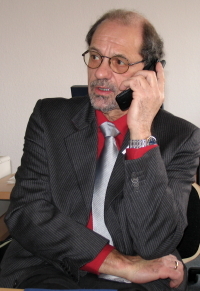 On July 4th 2008 the board coopted Wolfgang Forthofer, A-Salzburg as new 2. Vice-President. The free position on the board, due to the resignation of Tobias Baumann, will be newly assigned during the next General Assembly. On 16 May 2008 our 2. Vice-President Wico Bunskoek aged 61 years died completely unexpectedly. With his demise we did not only lose one of our most active Board members but also a wonderful person and dear friend. Wico Bunskoek was instrumental in the foundation of the European Network for Education and Training and contributed significantly to the development of our network in the difficult years after its foundation. He shaped EUNET with his passionate dedication to our European members and his talent to not only look for but also find pragmatic solutions. As director of Kontakt der Kontinenten he provided a lot of important input for our network and always asked us to look beyond the European borders. His commitment for our common cause will always be remembered. The EUNET Board will continue the work in Wico Bunskoek’s spirit and we will always remember him as the person he was – a fine person.